* All of our material is certified to AMS 5630. Standard AMS 5618 is an aerospace quality grade of 1.4125 / 440c. This grade can be offered from new production if required. Please enquire. Forged/Rolled, Annealed, Machined bars in 3-4 metre lengths (Cut to length if required). In the highly competitive world of manufacturing, sourcing high quality materials is essential. 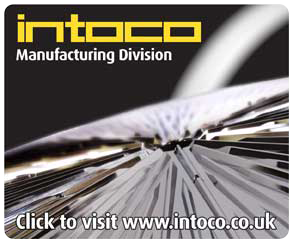 Intoco, a UK based manufacturing company, specialise in 'no-compromise' manufacturing using state of the art CNC equipment. We are also the UK's largest independent stockholder of hot work toolsteels. 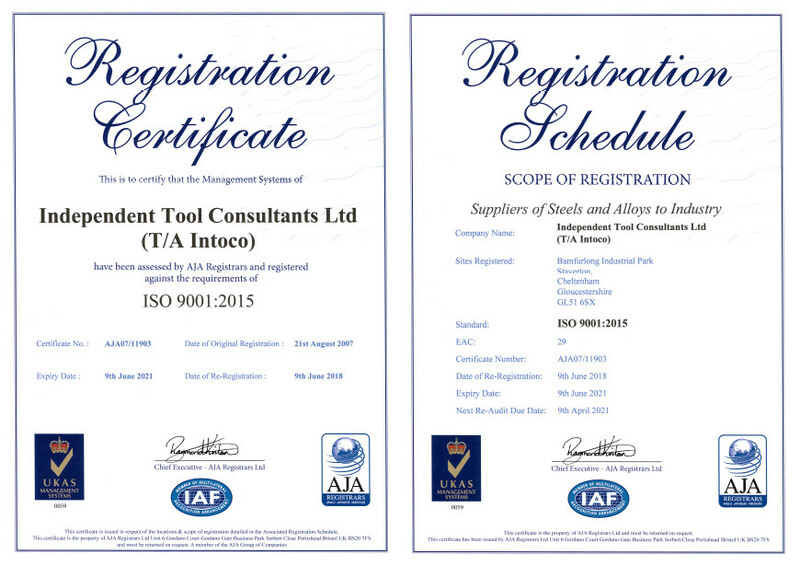 From the experience gained in buying high quality tool steel, Intoco have added a further steel to their range, this being a Chromium martensitic steel called 440C/1.4125/4125 Stainless Steel. In the hardened condition this material has a martensite + carbide structure. It is capable of attaining, after heat treatment, the highest strength, hardness (57 - 61 Rc) and wear resistance of all the stainless alloys. Its very high carbon content is responsible for these characteristics, which makes 440C/1.4125/4125 particularly suited to such applications as ball bearings, rollers and valve parts. Martensitic stainless steels are optimised for high hardness. The properties are specified for bar product in ASTM A276. It has good resistance to the atmosphere, fresh water, foods, alkalies and acids. The corrosion resistance of grade 440C/1.4125/4125 approximately matches that of grade 304 in many environments. 440C/1.4125/4125 Stainless Steel is used in a wide variety of industries including bearing manufacture, food applications, aerospace applications, surgical instruments, cutlery, etc. Amongst other manufacturer's, we stock Bohler Uddeholm grade N695 extra and Metalravne grade PK348. This is equivalent to :- Din 1.4125 - X105CrMo17. AISI 440c AMS 5630 UNS S44004 AFNOR Z100CD17 JIS SUS 440C UNI X102CrMo17 KU/X105CrMo17. 440C/1.4125/4125 Stainless Steel in the UK, Intoco now stock this in rolled/forged bar that can be cut to length as required.